SAS, the Pukekohe High School uniform provider, will move to Jan’s Uniform Shop at 19 Manukau Road and will open from 14 January 2019. There will also be 2 late nights: January 23rd & 24th with a closing time on 7pm. Pukekohe High School uniform shop has moved to Jan’s Uniform Shop at 19 Manukau Road is managed and supplied by The Uniform Shoppe. http://theuniformshoppe.co.nz or from Jan’s Uniform Shop at 19 Manukau Road. Please note that all online orders need to be collected from Jan’s Uniform Shop. Shop opening hours, uniform prices and uniform regulations are all published on the Uniform Group webshop. Where is the School Uniform Shop? All students must wear correct regulation uniform at school, on the way to and from school, and on all official school trips. At all times clothing must be neat, clean and tidy and worn correctly. All articles of clothing must be clearly named. Any clean, non-offensive shirt and shorts are permissible. There must be a change of clothing from normal school uniform. A tee-shirt or singlet in house colour is useful to have for inter-house competitions. Students may wear the optional Senior uniform from Term 3 of their Year 11 year. They must wear the uniform in its entirety, not a mixture of this and the Year 9-11 uniform. Skirts must be of appropriate length. Items of clothing that are not listed above may not be worn as part of the uniform. 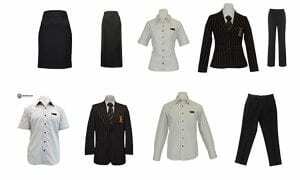 The uniform is to be worn at school, to and from school and at all school functions. Hair must be clean and tidy. Extreme hairstyles and unnatural hair colour are not permitted. Natural make up is permitted. Uniform must be clean and worn correctly. One fine plain link chain around the neck or a necklace of religious/cultural significance.